WASHINGTON (AP) — In 1942, they were lumberjacks, miners, hunters and farmers from the United States and Canada, who came together at a U.S. Army base in Montana. Within a few months, they were well-trained warriors who went on to become one of deadliest commando units in World War II. Nicknamed the Devil’s Brigade for their fierce tactics and practice of wearing black boot polish on their faces, the unit excelled during nighttime raids that featured mountain climbing, amphibious landings and parachute jumps. 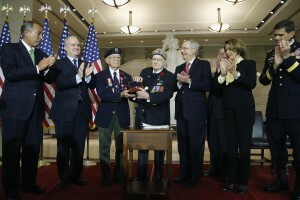 On Tuesday, Congress awarded surviving members of the Devil’s Brigade the Congressional Gold Medal, its highest civilian award. A crowd of about 700, including about 40 living members of the brigade, attended the hour-long ceremony at the Capitol Visitors Center. The 1,800-member unit, officially known as the First Special Service Force, included 900 Americans and an equal number of Canadians who specialized in hand-to-hand combat and mountain warfare. “These men saved the free world,” said a tearful House Speaker John Boehner, R-Ohio. The group’s achievements were all the more remarkable for how quickly they came together, Boehner said, noting that the unit was activated in July 1942, completed its first mission in 1943 and disbanded in December 1944. The brigade is the precursor of modern special forces such as the Green Berets. Senate Majority Leader Mitch McConnell, R-Ky., said members of the Devil’s Brigade excelled in rock climbing and amphibious assault. “They advanced on skis and through the air. They survived by stealth and trained in demolitions. Some of their more daring mission plans would have made James Bond blush,” McConnell said. Eugene Gutierrez Jr. of Texas, who enlisted in the Army in 1941, joined the Devil’s Brigade a year later. He fought in the coastal city of Anzio, Italy, in 1944 and later helped liberate Rome. Gutierrez accepted the gold medal, specially made by the U.S. Mint, on behalf of his fellow brigade members living and dead. “Guess what? They delivered,” Gutierrez said. The group also stands as a “shining example” of the abiding friendship between Canada and the United States, two countries that “stand as one,” said Rep. Jeff Miller, R-Fla, chairman of the House Veterans Affairs Committee.